The Spring run of salmon that enter the Scottish rivers are the most reliable of all the seasonal salmon runs these days. The physical condition and cold water fighting ability of a fresh run Spring salmon is superior to that of a Summer or Autumn fish. There's added excitement too in being back out on the salmon river after the Winter shut down. This is no doubt another added component of what makes a Spring salmon so special as there's always a deep satisfaction and thought involved in making sure your fly box is back in order when January arrives each year. In the very early months of the Scottish salmon fishing season it's unlikely that you'll see large numbers of Spring salmon showing in the rivers however there is a definite mind set that needs to be implemented for success during the early Spring months. In January and February on the salmon rivers of Scotland there are always early Spring salmon present. You really need to grasp this concept before it's proven to you by another fishing guest. It's so easy to make the wrong assumption due to your expectations of seeing salmon jump which often they will not do when the river is running very cold until the warmer later Spring months arrive. Fish off your senses and stay focussed with faith on the precision of your water coverage. Look for the deeper slow moving areas of the pools and be careful with your approach as often in the higher water levels of Spring these areas can be often no more than a rod's length out from the riverbank. An early running cold water Spring salmon will be holding approx 2 to 3 ft under the surface of the river and very often close to the riverbank which makes them very easily spooked following a clumsy pool approach. So you understand fully why an early cold water salmon will be sitting high in the water column in early Spring that is exactly where the slightly warmer water thermals are located. To prove this point if you go and look into any of the Scottish fish ladder viewing chambers during early Spring you'll see the kelts from last season holding in this very position and not down deep in the really cold deeper water. Forget the 'slow and deep' advice we are all brainwashed with in books that are written by would be ghillies and let good old logic and personal experience be your guide. A slow and high fished lure or fly will be right onto a Spring salmon's nose in the cold water of early Spring and make no mistake about that fact. A deeper presentation is only sometimes necessary when the river starts to warm up after mid March through to early June which often pushes holding salmon down in the water column to the cooler deeper areas of the pools. My late mentor Willie Laird proved this point to the new owners of his River Tay beat when he took 4 salmon before lunch on a high fished 'harled' tube fly while their deeper swimming lures touched nothing. When Willie put up the fly rod that day in 1970 on the Tay's opening day he was questioned by the new owners as to what he was doing and why. By lunch time his lesson to his new bosses was over and they no longer dared question his professional salmon fishing experience or tactical decisions. 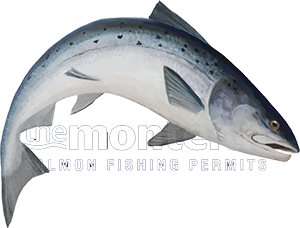 Maintain inner confidence and fish effectively & consistently as one thing for sure is that you'll see a Spring salmon once you hook one even if they are not showing in the pools up to that point. A big sub surface flash of silver commotion is an addictive drug and especially if there's any sunlight present and the briefest glimpse of this will stay in your mind indefinitely. Nothing beats the cold water scrap of a fresh run Springer and booking your Spring salmon fishing early is always advisable to secure a rod on the better known early Spring salmon holding beats.